The image FORMULA DR-7550C production scanner delivers true high speed scanning, capable of providing enterprises with reliable, high quality images, and flexible scanning solutions to enhance their document management systems. Physical handling, off-site storage and retrieval, and labor costs can be drastically reduced with efficient document management systems. This scanner’s winning combination of leading value, increased scanning speed, reliability, and efficiencies can help companies reduce their overhead costs associated with document management and retention. 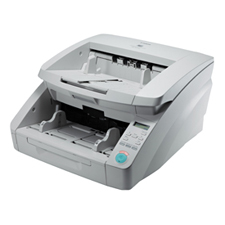 This scanner comes bundled with Canon CapturePerfect and Kofax VRS software.